1983 was the start of a disastrous period for the once-seemingly indomitable video game industry. With the market overly-glutted from too many competing systems (and a similar brawl wrecking havoc among the nascent personal computer business) many individuals and families completely abandoned home video gaming out of sheer frustration. Neither were matters helped by corporate bungling that has since taken on legendary proportions: witness E.T. : The Extra-Terrestrial and the Pac-Man port for the Atari 2600. And yeah, the "Atari Landfill" story is completely true. Let's not even begin to talk about turkeys like Porky's and Custer's Revenge (I'm telling y'all kiddies who weren't around then, that you missed something else...). All of which makes it the more astonishing that in the dying glow of video gaming's first burst of prominence, one title was produced which a quarter-century later is still hailed as one of the greatest and most groundbreaking games of all time. 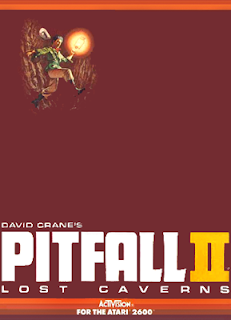 Pitfall II: Lost Caverns was released by Activision in March of 1984. It was the sequel to 1982's Pitfall!, one of the biggest selling titles for the Atari 2600 system and still considered one of the most classic video games ever produced. Activision programmer David Crane designed and wrote both games. But for the follow-up Crane abandoned Pitfall! 's tried and true formula, and instead opted to change things up a bit. And what changes they were! Pitfall II: Lost Caverns wound up being the largest game ever produced for the Atari 2600. And in the process it introduced new elements that are now considered to be standard fare for most modern video games. Gone from the original was the twenty minute time limit: you could now play as Pitfall Harry for however long you wanted. And you were gonna need all that extra time too, because no other console game of the time boasted as big a geography as Pitfall II. Whereas the original game had Pitfall Harry trapped running horizontally, the sequel was but eight full screens across... each made of twenty-seven vertical levels. Most of those had Harry plunging into the pitch black of a long-lost subterranean network beneath the mountains of Peru. Just make sure that you've explored all eight screens of the ground above before you enter the underground, 'cuz there's no going back. But once you've gone deep, Pitfall II: Lost Caverns plays much like any modern "sandbox"-style game. You can run, jump, swim and dive (another addition from the original) through two rivers, all the while avoiding the underworld's treacherous wildlife (bats, poisonous toads, the classic Pitfall! scorpions, Andean condors, and electric eels). There is no one single way to win the game: you have all the freedom you could possibly want in order to reach the end. One of the things about Pitfall II that a lot of folks still remember fondly about the game is its soundtrack. When you start Harry off on his adventure you get a heroic theme that eventually tapers off to a more subdued tune. Collecting a prize restarts the theme again. Getting hit by something bad gets a more downbeat tune playing, for however long it takes Harry to get transported back to the last healing point. And if you catch a ride on a balloon (really specimen bags that Rhonda filled with steam from a geyser) you're treated to a rousing rendition of "Sobre las Olas". All of this came at a curious price: the Atari 2600 system's hardware could not, by itself, handle all of Pitfall II's technical demands. Game creator David Crane engineered and patented a special component that was embedded in the cartridge along with the game's ROM. Called a Display Processor Chip (DPC), it enabled Pitfall II to be capable of much more than any other cartridge for the console. Crane had hoped that the DPC would extend the shelf life of the Atari 2600, but the deepening game "recession" along with the age of the system (nearly eight years old at the time) meant that the DPC never got a chance. But Pitfall II: Lost Caverns did. And even today, the game holds up surprisingly well. If you want to play it, it was included in the Activision Anthology for the Gameboy Advance a few years ago, and I've seen it packed with some of those fancy "plug-in" joystick controllers that you can find in toy stores. I've seen a few other official releases of it as well in recent years. However you find it, whether you're new to the game or you've been underground many time before, Pitfall II: Lost Caverns will keep you entertained old-school style. I love that game! Although I haven't yet made perfect score. I have the Activision Anthology version. Pitfall II's cover art is one of the best ever of a videogame. That might be an Xbox 360 game if I didn't know better.